Stephen Charrier, President of Rollerblade USA, and Rob Gill, of InlineSkates.com, review the 2015 Rollerblade Macroblade 100 ALU Mens and Womens Inline Skates. Hey, thanks for joining us on the Daily Spin. I'm Rob from inlineskates.com joined today by Steven Cherrier - president of Rollerblade. Steven, thanks for being here. Thank you for having me, Rob. Talk about a really, really cool skate in the Rollerblade lineup - the Macroblade 100. The 100 in the name actually refers to the wheel size of the skate so you're moving into that real high performance type skate here. It is. 100mm wheels definitely roll. They're fast. They roll over things really wheel. It makes a great skating experience. For sure, and then coupled with the bearing and an aluminum frame here, you're getting a real high-performance power transfer and a smooth glide. It is. Just looking at this, Rob, the Macroblade skates in general, the fit upper part of the Macroblade is great. We have really hit something solid with the whole Macroblade family. Fits a wide range of people, great performance product. What's unique about this skate is that it has a full, the Macroblade cuff and everything, is a full height skate so the people are going to give a lot of support. You're also going to get braking support so this is a unique skate where you're getting 100mm wheel for the roll and the speed and the experience but you still have the support of a full height skate and it comes with a brake too. The brake is in the box, we don't have them on these samples. For sure, and then talking about the fit, talk a little bit about the differences in the women's fit and the men's fit. Yeah, the women's fit is just not a smaller men's skate, it's a specific women's liner, has a higher instep, a narrower heel and a number of features to accommodate a specific women's fit. For sure, which is really important especially talking about a performance skate. Also available in full and half sizes so you can really ensure that you're getting a perfect fit in this skate. So, just back to the specs a little bit, the skate has a metal buckle on the top so a really solid closure to it. The 100mm Supreme wheels so these are high performance, high-rebound wheels so it's going to be a lot faster. And has an SG9 bearing and an extruded aluminum frame so this is a nice performance skate, again, with full support. For sure, and then talking about their performance, who would you gear this skate towards? You know, this is open for a lot of different skaters. Someone who is going to go skate some distances, someone who wants a big wheel experience which is a much nicer ride so this is a great training skate for someone who wants full support. Awesome. 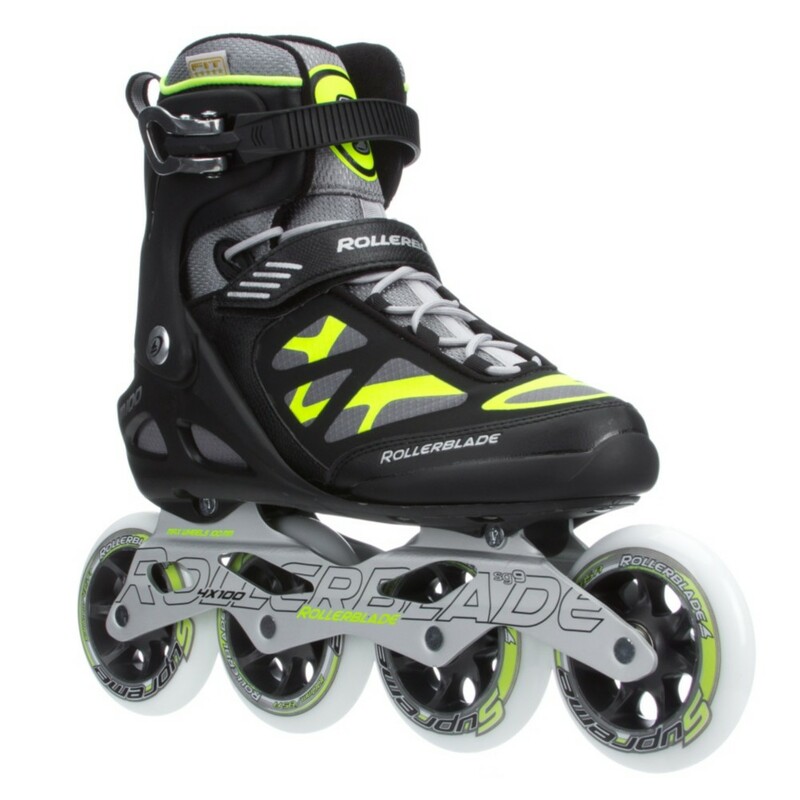 So, really cool skate in Rollerblade's line up - the Macroblade 100 men's and women's skate. Thanks for joining us on the Daily Spin and check the skates out on inlineskates.com.